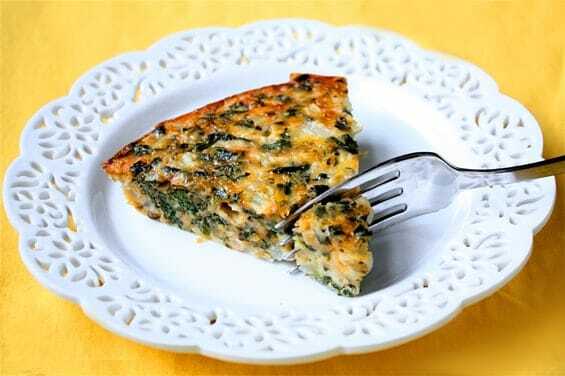 Delicious and satisfying, this healthy Spinach and Artichoke Quiche Recipe is one of go to, reliable breakfast recipes. It’s packed with protein, calcium and vitamins, so even if you decide to indulge and have 2 servings, you won’t be going overboard on your Weight Watchers Points. My whole family loved this tasty, low calorie quiche recipe, and I loved the full feeling I had after eating it! If you are looking for healthy recipes that are Weight Watchers friendly, you’ve gotta give this Artichoke and Spinach Quiche a try! Enjoy this delicate and delicious Spinach and Artichoke Crustless Quiche Recipe without an ounce of guilt. This is a meal that will make any Weight Watcher jump for joy. Spray 9-inch pie plate with non-fat cooking spray. Boil 4 cups of water in a medium saucepan. Spray a medium skillet with non-fat cooking spray and put over medium-high heat. Saute onion and garlic until softened, stirring occasionally, about 5 minutes. Set aside. Add spinach and cook until spinach begins to wilt. Then, add artichoke hearts, tarragon and parsley, and saute for about 2 minutes. Meanwhile, whisk together milk, eggs, 1/2 cup of cheese, lemon zest, salt and pepper. Pour into prepared pie plate. Scatter garlic & onion mixture evenly over egg mixture. Sprinkle with remaining 1/4 cup of mozzarella cheese and the parmesan cheese. Turn oven to broil. Broil quiche 3 inches from heat until golden brown, about 2 minutes. Let stand for 5 minutes before serving. I actually just had a quiche for the first time last weekend. It was pretty tasty. I just don't know how healthy it was. I really enjoyed your post because it gave me a new way to use artichokes. Usually I make this Artichoke & Jalapeno Dip. It's good, but I needed something new. Thanks! I will bookmark your site!